Experimental peptide 1 served as an effective inhibitor of cast nephropathy in vivo. Changes in (A) mean serum creatinine, determined by tandem mass spectrometry, and (B) medullary cast formation of 3 groups of rats (n = 5–6 per group) were determined in a rescue experiment in which the competitor cyclized experimental (exp.) peptide 1 (AHX-CLSADSSGSYLYVCKK), a control cyclized peptide (AHX-CLSAHSSGSYLYVCKK), or vehicle alone was administered intraperitoneally 4 hours after rats received the nephrotoxic FLC (κ2). Mean serum creatinine increased in the vehicle-treated and control cyclized peptide–treated groups, but rats given competitor cyclized peptide 1 were protected from AKI. Animals that received experimental peptide 1 had fewer casts in the medulla compared with animals that received either vehicle or the control peptide. 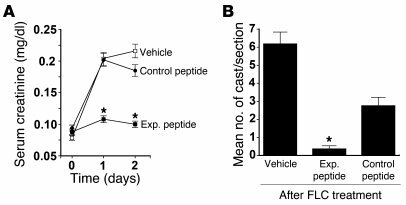 Rats that received the control peptide also had fewer casts (P < 0.05) than animals that received vehicle alone. *P < 0.05, compared with the other 2 groups. Data are shown as mean ± SEM.